The frontier of the Old Southwest has been something of a blank spot on the Frontier Partisans map. That’s something I intend to rectify in WoW2, because the Creek Nation Civil War and the fight over the rich black soil of the Deep South stirs up tales every bit as compelling as those that sprang from Kaintuck or the Mohawk Valley of New York. In scope and consequence, the saga of the Old Southwest frontier is unparalleled. The Creek War of 1813 made Andrew Jackson president and opened up to American settlement 20 million acres of rich cotton planting land — guaranteeing that the slave economy would not die out but would grow and render the regional and cultural clash of the American Civil War inevitable. The precipitating incident of the Creek War, the massacre at Fort Mims in what is now south Alabama, claimed more than 400 lives (more than half of them civilian) and was the greatest slaughter of civilians in frontier history. The decisive Battle of Horseshoe Bend saw the highest casualty count among a native resistance force of any battle in U.S. history. Brief though it was — only about eight months — the 1813-14 war was one of the largest and most savage conflicts on the American frontier. In terms of the theme of WoW2, the Southwest was a fertile ground for cultural blending. In fact, most of the leaders of all factions within the Creek Confederacy were of mixed native and Scottish blood and culture. Just take a run through the names of chieftains, war leaders and prophets and the cultural blend is evident: Alexander McGillivray, Josiah Francis, William McIntosh, Peter McQueen, William Weatherford — nativists and assimilationists alike. So… yeah, this is territory I need to explore. My guide on this trek into the forests and swamplands of the Old Southwest turns out to be one of the finest books I have encountered in a lifetime of Frontier Partisans studies. 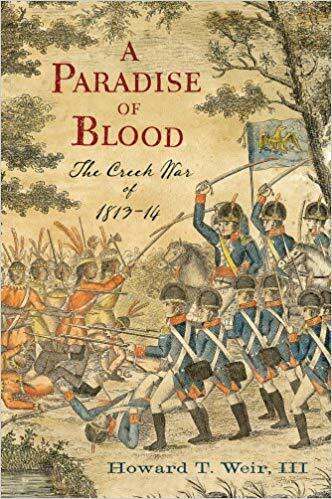 A Paradise of Blood is simply sublime — deeply researched and written with such verve and color that I find myself lost in the world it depicts as vividly as a novel. Intricate politics, the outlandish ambitions of men and nations, and almost unfathomably brutal partisan warfare are recounted with undisguised relish. I have a mountain of work to accomplish in the next couple of weeks, and I find myself resenting it, not for its fatigues but for its capriciousness robbery of time I want to spend swilling myself drunk on this heady distillation of 100-proof narrative history. This looks worth picking up.